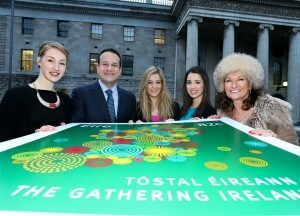 Launching the Gathering stamp: Minister Varadkar with Celia Holman-Lee and her students. This year’s St Patrick’s Festival in Dublin was the most successful ever staged. Record numbers of people from abroad joined in the fun, or marched in the parade. As St Patrick’s Festival is one of the key events for the Gathering, it’s also a great way to see how well the Gathering is doing. And the signs at this stage are pretty good. A quarter of visitors for St Patrick’s Day this year were from the US. According to Fáilte Ireland, spending by overseas tourists was much higher than previous years. Of course, its still early days for the Gathering. We can’t tell how the rest of the year will go, and we only have visitor figures up to March. But even those figures are very positive, showing a 7.4% increase in visitor numbers to Ireland for the first quarter. The tourism industry is giving us positive feedback, and we have more great events to announce. All in all, I’m very encouraged. Since it all kicked off in Dublin on New Year’s Eve I’ve had the pleasure of seeing a few Gatherings at first hand, including the Páidí Ó Sé Football Gathering in West Kerry. This extraordinary event featured GAA players from around the world. I watched Spanish-born GAA players taking on Watford GAA in an international festival of Gaelic football. Last weekend my own family Gathering took place in Dungarvan, Co. Waterford. This is my mother’s home town and the family has been there for generations. It coincided with the town’s first Maritime Festival. The event exceeded all expectations, with more than 60 relatives attending from Ireland, the UK and America. It was a great chance to reconnect with relatives who I hadn’t seen for years, and to meet some new ones. Many people were initially sceptical about the Gathering, and they were probably right to be. 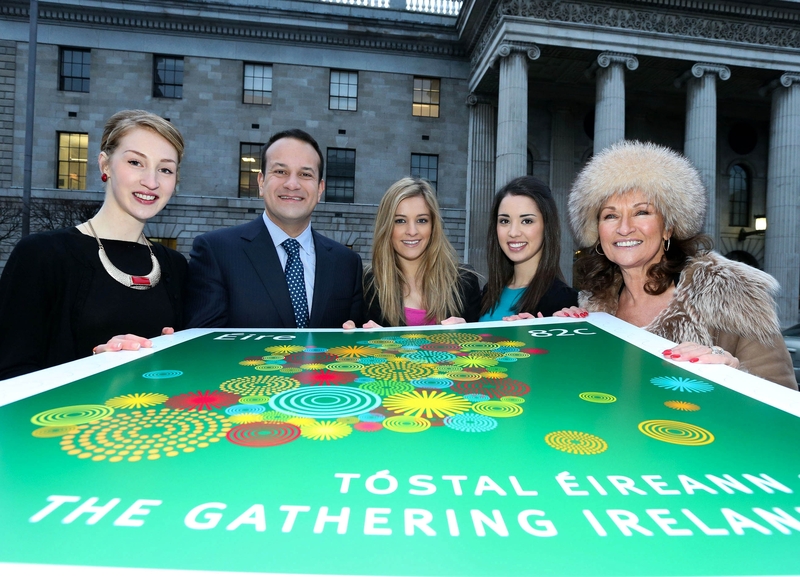 After all, organising the biggest tourism event ever held in Ireland is quite a big ask, especially when it involves huge numbers of volunteers. But people across Ireland have really bought into it. In Dublin alone some 781 Gatherings have been organised, with a total of 3,000 events taking place around the country, big and small. Although we want to use the Gathering to reboot the tourism industry, there’s much more to it than simply boosting visitor numbers. Open any regional newspaper, and you’ll find stories about local Gatherings being held. It’s helping to restore community pride and initiative, at a time of considerable national and international uncertainty. We also want to revive and renew Ireland’s unparalleled global connections. Our diaspora is one of our greatest strengths. Every parish has connections with other parts of the world, and Ireland remains the most globalised country in the world. Our international links represent a great opportunity to help to get Ireland back on its feet. None of this would have happened without the Gathering team, the staff in Failte Ireland and Tourism Ireland, and the hundreds of people around the country organising Gatherings at local level. I also hope that the Gathering will bring long-term gains, and we are already looking ahead to its legacy. The Dublin New Year’s Eve Festival was a massive success, and I think Dublin will come to rival Edinburgh and Sydney as one of the best places to see in the New Year. New festivals being held this year for the first time – like Rebel Week in Cork – could become annual fixtures. Others have been revived, such as the Strawberry Fair in my own part of Dublin. It’s happening in Longford, it’s happening in Meath, Kerry, Donegal, Carlow…you name it, and there’s a Gathering. If you haven’t already, there’s still plenty of time to organise your own. This article was first published in the Herald newspaper.